FOR Tony Hoang, spreading beneficial bugs on his entire strawberry crop is a daunting task. Walking along the rows of plants, sprinkling the predator bugs by hand, is a huge drain on his time and labour. “It takes four days – and my knees at the end are so sore,” Mr Hoang said. He could be saved a lot of pain thanks to technology changing the face (and knees) of farming – unmanned aerial vehicles (UAVs), or drones. Former strawberry farmer of 20 years Nathan Roy has started Aerobugs, a company that marries the increasingly useful weapon of beneficial bugs with the efficiency of a drone. He has teamed up in an exclusive partnership with Bugs for Bugs, one of Australia’s largest suppliers of biological control agents, based in Mundubbera. “They were the only company that was interested in giving it a go,” Mr Roy said. For decades, farmers have used bugs to control pests like the red spider mite and two-spotted spider mite, which affect hundreds of vegetables and food crops, including peppers, strawberries, tomatoes, potatoes, beans, maize and ornamental plants like roses. The practice has played a big role in reducing the amount of pesticides sprayed on crops, which in turn has helped keep resistance at bay. Phytoseiulus persimillis, or the predator mite, is commonly introduced to keep the pests in line, each eating up to 28 two-spotted mites a day. They are almost impossible to see with the naked eye and using the Aerobugs UAV they tumble out of the sky in their thousands in a mix of the sand-like vermiculite, which is sprayed over the crop. With a full load, the drone weighs 19kg and can cover one hectare in seven minutes, operated by batteries. Mr Roy visited Bundaberg to demonstrate the technology, which can complete in seven hours what normally takes Tony Hong four days. He now has two patents for the technology. Bundaberg Fruit and Vegetable Growers’ industry services officer Kylie Jackson said it was encouraging to see local farmers willing to innovate. “Sometimes (farmers) will say ‘my grandfather did it this way, my father did it that way and I’ll keep doing it this way’. There are limitations – the drone can’t operate in the rain and human observation is needed to identify hotspots where pests gather. 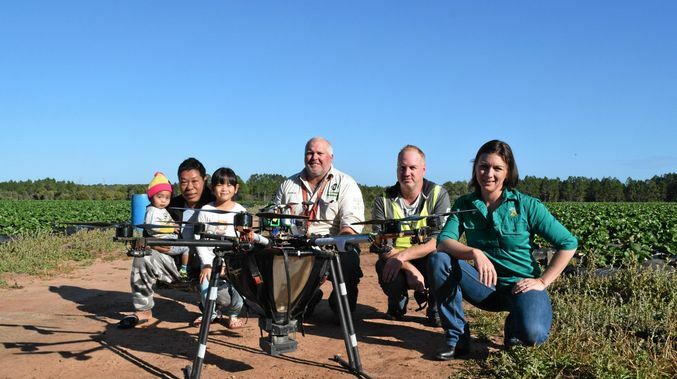 Aerobugs is one of a number of drone suppliers in the region, including Hervey Bay’s Southern Drones, which also offers NDVI imaging that can survey the crops using an infrared camera. But there is no doubt drones can make life easier for farmers. “It would give me more time to spend with the family,” Tony said, flanked by his two young children, Tommy and Millie.